We are a 501c3 non-profit charity who do what we can, when we can, to help the animals in need in Jackson, MS.
"I first saw "Missy" on Facebook in January 2016. I was so drawn to "Missy." Her story of being tied to a make shift dog house with her puppies was very similar to Gypsy, a pit bull, I had previously fostered through another rescue group. After several messages and phone conversations with Marie about fostering, "Missy" was delivered to my house. She was very thin and covered in scars from what I believe to be a horrible, abusive past. "Missy" was afraid of everything, everyone and every little noise. It was heartbreaking to see her sit and tremble in her kennel, too afraid to come out. When she did venture out, she would cower and run when we reached to pet her as if we were going to hit her. "Missy" soon made friends with our other dogs (two doxies and a poodle, all rescues). We slowly made progress wiping those fears and that terrible past away. We started not call her Sunny D, short for Sunshine Day. That is what I saw in her happy smile as she began to trust me. For the first time in her life she knew what it felt like to be loved. In March 2016, my husband agreed to officially make Sunny a member of our family! Her pittie personality has blossomed! She is a giant, very vocal goofball and we couldn't love her any more than we do! We even get updates on her pups who were all adopted and that does my heart so good! Only the physical scars of her past remain. She is beautiful, happy and healthy. 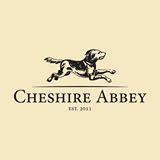 I hold the Abbey in highest regards, especially Chrissy and Marie for their endless work rescuing animals in need. Thank you for all that you do!! Without you, we would not have our Sunny D!!"